Milorad Pavić is one of the greatest Serbian writers and one of the most important European masters of Literature. His works are characterized by a sensitive lyricism and a haunting eroticism, remaining faithful to the unique complexity of Serbian Literature, a characteristic of the Balkan writing. I believe that Forever and a Day (as is the English title of this work) is his most impressive creation. This is an outstanding example of Dramatic Literature, a frightfully ‘’difficult’’ genre. 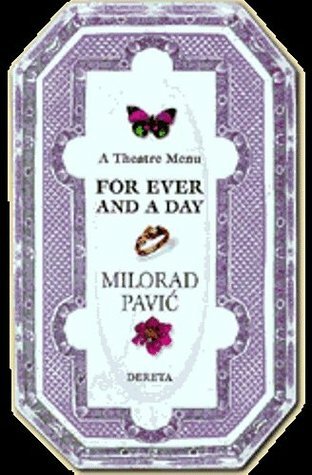 Pavić created a play like a menu with three ‘’starters’’, a single ‘’main course’’ and three ‘’desserts’’ that can form nine versions of the same play depending on the choices of each director. I have never read something similar, I don’t think there is a similar play to be found. A composition of Dictionary of the Khazars, Landscape Painted With Tea and Last Love in Constantinople, three of his most famous novels. Ten different settings and four time periods in an extremely complex drama that may be a little too difficult to understand by reading. We have to watch the characters and experience the dialogue in action to fully appreciate the Beauty and the Strange in Pavić’s writing.